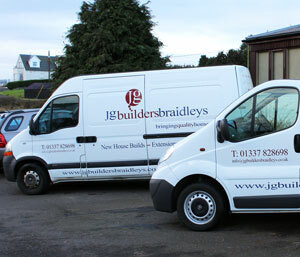 JG Builders Braidleys Ltd is an award-winning family owned and operated business, based near Auctermuchty in Fife. We work all over Scotland, but mainly in the Central Belt and Fife. We have extensive experience in building individual homes to our customers exact specification, giving each of our customers our personal attention. 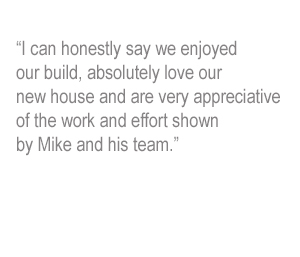 We are often told that we build our customers new home and other projects with them rather than for them. 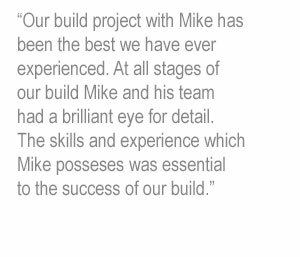 Please see a customer testimonial outlining each stage of the build process of one of our new house builds in Milnathort, Perth and Kinross. We can guide you through the whole construction process from design to completion, advising you on all aspects of your build. If needed, we can advise you on planning warrants and building warrants as well as choice of materials and costings. We specialise in new build timber – framed houses, and we supply the timber frames. 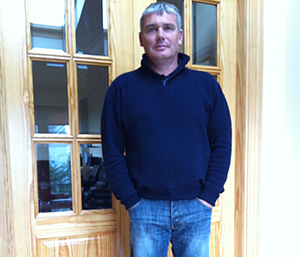 Mike Hoggan is Managing Director of JG Builders Braidleys Ltd and has over 30 years experience in building, with particular expertise in carpentry. To date, JG Builders Braidleys Ltd have built over 29 stunning new timber-framed houses, and renovated and extended an extensive portfolio of properties. We have a team of seven employees. JG Builders Braidleys Ltd are members of NHBC and we are proud to conform with the high standards of construction adopted by them. JG Builders Braidleys Ltd was recently awarded an NHBC Pride in the Job Award for excellence in site management for a house built in a rural location in Fife. The project was to build a house into the side of a hill giving the appearance of a bungalow from the north side and two storey house to the south. The lower floor is a traditional build whilst the upper level is built from a timber frame kit. Building the basement level into the rock face meant that Mike Hoggan, Managing Director of JG Builders Braidleys Ltd, and his team had to ensure adequate tanking was applied to provide suitable waterproofing. Mike Hoggan has worked within construction for 30 years beginning his career as a joiner before branching out to housebuilding, and has now built over 29 new homes for delighted customers. In addition to its unique positioning, internally the award-winning house provides living space tailored exactly to the customers needs – from the spacious balcony and unusually positioned bath within the window of the master bedroom which both provide panoramic views across the surrounding countryside to the custom built wine cellar – the house meets the specific needs of the couple. Please see our Awards page for more information. We have many delighted customers -what do our customers have to say? We are an award winning building company who have extensive experience – over 30 years – in the building trade, specialising in timber framed houses, extensions and renovation work. Based in Fife our projects are mostly in East and Central Scotland, but we have also worked in other areas of Scotland. We manage our projects working closely with our customers, ensuring flexibility in the build process. We are a family owned and run company, and pride ourselves in our high standards of customer service and aftercare. JG Builders Braidleys Ltd are timber framed new build house experts, our houses are built to the highest specification. We are NHBC registered which gives a 10 year insurance policy. All our work conforms to NHBC standards. All types of building work undertaken- loft and cellar conversions, garage conversions, kitchen installations, flooring, windows and doors, tiling, roofing services and joinery.